Publisher: University of California Press, U.S.A. In the late 1800s American entrepreneurs became participants in the 400-year history of European economic and ecological hegemony in the tropics. Beginning as buyers in the tropical ports of the Atlantic and Pacific, they evolved into land speculators, controlling and managing the areas where tropical crops were grown for carefully fostered consumer markets at home. As corporate agro-industry emerged, the speculators took direct control of the ecological destinies of many tropical lands. Supported by the U.S. government's diplomatic and military protection, they migrated and built private empires in the Caribbean, Central and South America, the Pacific, Southeast Asia, and West Africa. Yankee investors and plantation managers mobilized engineers, agronomists, and loggers to undertake what they called the "Conquest of the Tropics," claiming to bring civilization to benighted peoples and cultivation to unproductive nature. In competitive cooperation with local landed and political elites, they not only cleared natural forests but also displaced multicrop tribal and peasant lands with monocrop export plantations rooted in private property regimes. This book is a rich history of the transformation of the tropics in modern times, pointing ultimately to the declining biodiversity that has resulted from the domestication of widely varied natural systems. 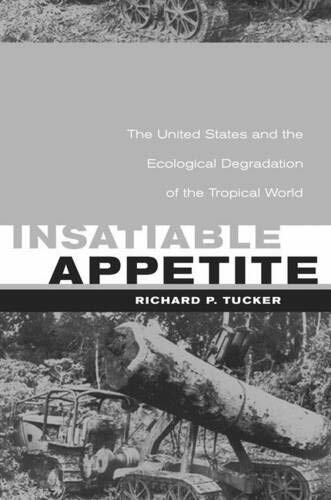 Richard P. Tucker graphically illustrates his study with six major crops, each a virtual empire in itself―sugar, bananas, coffee, rubber, beef, and timber. He concludes that as long as corporate-dominated free trade is ascendant, paying little heed to its long-term ecological consequences, the health of the tropical world is gravely endangered.